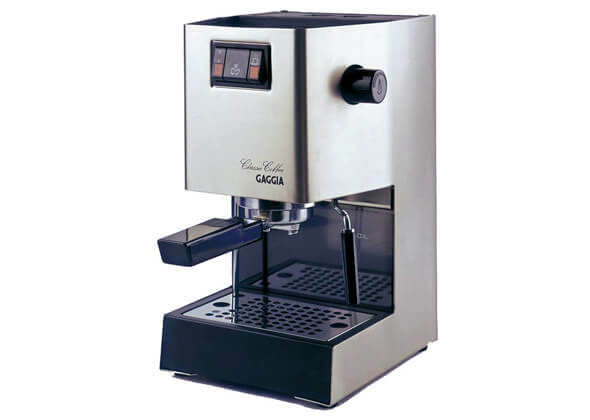 The Gaggia Classic Coffee Machine is the veteran of home coffee espresso machines, as it is one of the oldest continually available units. It is the benchmark by which all other home coffee espresso machines are measured, and we’d love to find out why it has that honorable distinction! This Gaggia Classic is a manual espresso that is considered to be a “prosumer” unit, meaning it’s a professional grade machine built for the ordinary home consumer. It is both an espresso machine as well as a drip coffee maker. The manufacturer also claims it as one of the most successful espresso maker for home by the brand ever. That is a very ambitious statement, so naturally, we had to put it to the test and see whether the Gaggia Classic Coffee Maker will really perform as well as advertised. • The design is sleek and simple, yet quite elegant. It will look great sitting on top of your kitchen counter. • It is very easy to use. Even a total beginner can make great coffee and espresso by simply following the instructions that accompany the machine! • Its brass components along with the 15 bar pressurizer ensure you get a consistent coffee temperature every time you brew a cup of coffee or pull a shot of espresso. This is essential for creating great espresso with perfect crema. • The large water reservoir saves you from having to remove and refill too often. • It comes with crema device that will deliver thick tasty crema to go along with your espresso. • The turbo frother will generate super thick and foamy froth for making your favorite milk-based coffee drinks. It works very quickly and will only take a few seconds to transform your milk into a beautiful froth. • This machine is very quiet compared to other similar coffee machines. It makes minimal noise while operating, so you won’t wake up the whole house while making your morning coffee or espresso. • The machine takes a long while to warm up before it is ready to make your coffee beverages. • Assembly can be tricky if you are not technical-minded. • Clean up is time-consuming and cumbersome with this machine. You will have to detach several parts to clean and also invest in proper cleaning solutions to do it right. • The nozzle of the frothing wand is quite low so you might have a little trouble fitting your cup underneath it. • The tamper is made of plastic and feels quite flimsy. This suggests that it might not retain functionality for very long. We can see why this Gaggia coffee machine has been a popular choice among coffee and espresso lovers for so many years. Though, we have liked BES870XL by Breville and Gaggia Titanium too, but the Classic by Gaggia is simple to know and doesn’t costs heavy. It is sturdy, reliable and consistently delivers impressive coffee drinks and thick foamy milk froth that will keep your family and friends hanging around your kitchen for more of your coffee creations! What is most impressive, is how easily we can use it, considering it is a manual espresso machine. Very often, manual machines have a steep learning curve for the novice home-barista, but this is not the case with the Gaggia Classic. Learning to use it is not a complication, and you will be making fantastic espresso and coffee faster than you expect. As always, maintain it, clean it and this coffee machine will keep producing excellent cups of coffee and espresso for many years. It will last for up to 10 years if properly maintained. So be sure to treat it right and it will treat you right too! For best results, invest in a high-quality coffee grinder, use only the finest available coffee beans and consider buying a good metal tamper. All in all, it is a highly effective coffee machine. We wholeheartedly recommend it for your home if you desire high-quality espresso with wonderful crema and rich, flavorful coffee beverages. Do also have a look on the Breville Duo-Temp as it’s also an excellent product under the same category.